The front area is something that was studied very carefully, and apparently the aerodynamicsts must have learnt quite a bit from the recent McLarens. The nose cone in particular is very much alike the MP4-21 of 2005. It has a similar height, thickness and width. The front wing is a little more in line with BMW's last designs but still is a three element wing hung up on the second one, typical designs of a McLaren. Even more, since the MP4-18 every McLaren has its front wing extend ahead of the nose cone, and now BMW Sauber have it just like that. As I should not exaggerate, the deep spoon is eye-catching while the new wing totally lacks any stacked or bridged elements. very interesting remarks though, F1.08\'s front wing looks much cleaner than last year\'s & thankfuly they got rid of those add-on bridges. hey tomba..whats the use of having the front wing extend ahead of the nose cone? I\'ll save NaZzO the time: I also mean the MP4-20! 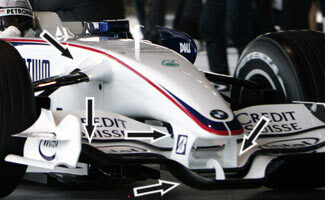 The advantage of a more forward front wing compared to the nose cone is especially valid for very low noses. Having both closely together can stir airflow a bit, while the design of BMW has clean air all over the width of the wing. As a result there is potential for better efficiency of the FW. The MP4-20 had much wider nosecone. I\'d say it\'s more like MP4-19B Monza version.